All four key posts in the Jawaharlal Nehru University Students' Union polls went to the Left Unity with comprehensive margins. On Sunday, after a day of drama over the counting of votes, 26-year-old research scholar N Sai Balaji was elected Jawaharlal Nehru University Students’ Union’s president for 2018-’19. 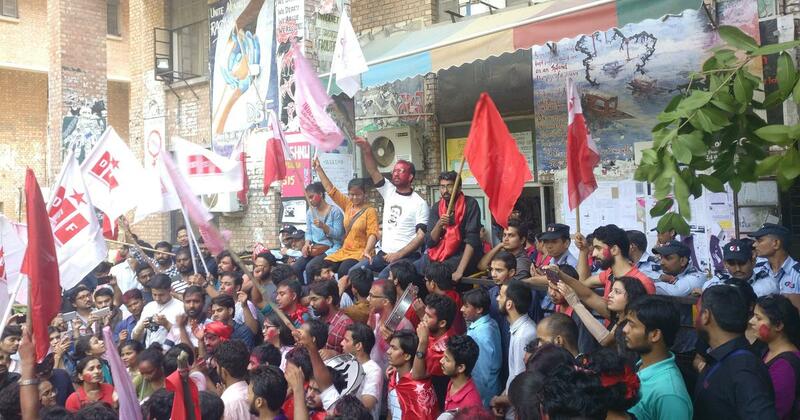 Representing Left Unity – the coalition of Left-leaning students’ groups – Balaji won with 2,161 of 5,170 votes. The runner-up, Lalit Pandey from the Akhil Bharatiya Vidyarthi Parishad garnered 982, losing by over 1,000 votes. Left Unity is composed of the All India Students’ Association (to which Balaji belongs), Democratic Students’ Federation, Student’s Federation of India and All India Students’ Federation. All four positions in the central panel – the main four posts that are not attached to a particular school or centre – have been won by this group. The Parishad, despite Pandey claiming they are “the single largest organisation on campus” lost by similarly large margins. Sarika Chaudhary from the Democratic Students’ Federation is the new vice-president, having defeated the Parishad’s Geetashri Boruah by over 1,500 votes. 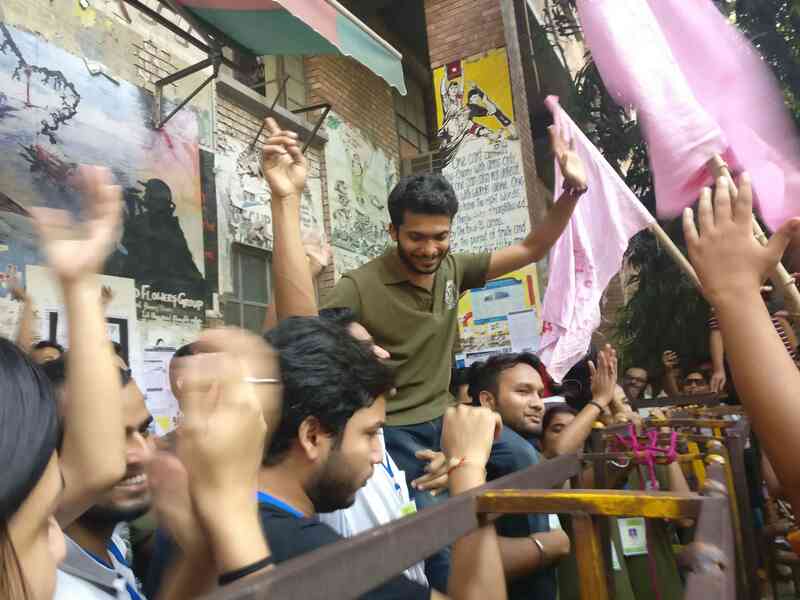 Aejaz Ahmad Rather from the Students’ Federation of India won the post of general secretary by 1,300 votes. 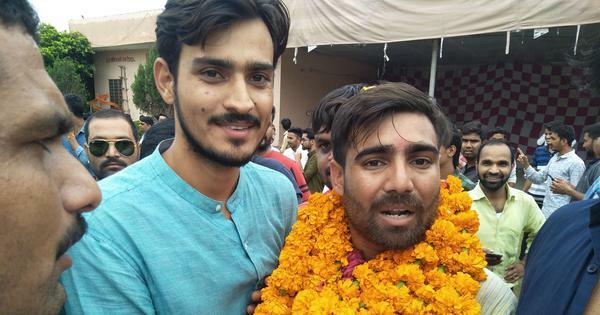 The narrowest victory margin was for the post of joint secretary – Amutha Jayadeep from the All India Students’ Federation defeated the Parishad’s Venkat Chaubey by 800 votes. These margins are massive considering how close the contest between the Left and the Parishad has been in the university since 2014 – Kanhaiya Kumar had won the president’s post by just 105 votes in 2015, and last year, Geeta Kumari won the same post by less than 20 votes. 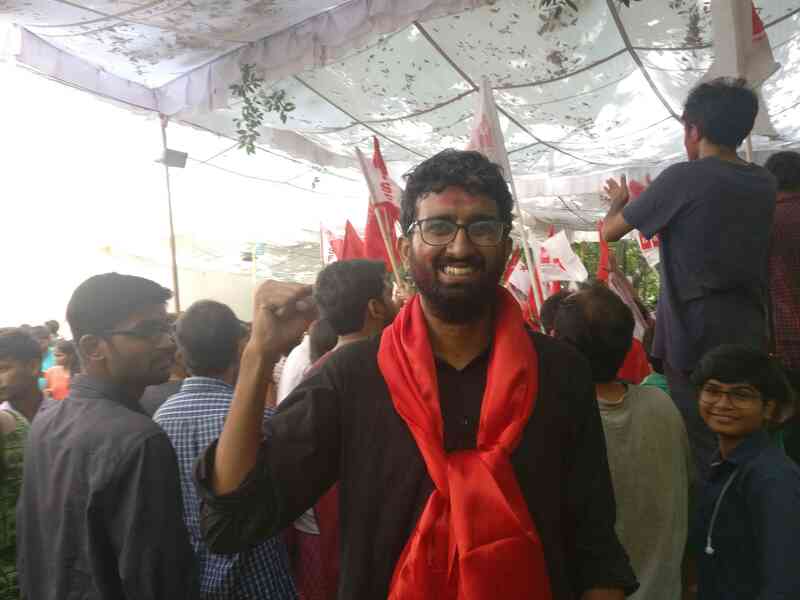 Originally from Hyderabad, N Sai Balaji studied at Chaudhary Charan Singh University's Noida branch and said he “came to JNU the same year Modi came to the Centre” – 2014. (Photo credit: Shreya Roy Chowdhury). The last two days have been particulary bad for the Akhil Bharatiya Vidyarthi Parishad, which is affiliated to the Rashtriya Swayamsevak Sangh. In addition to picking the four main students’ union leaders, students also elect their representatives in the various schools of study in these elections. These representatives form the council. Till last year, the Parishad could count on votes in the smaller science schools – Pandey, a research scholar in the School of Sanskrit Studies, called them an “ABVP’s stronghold”. Last year, their tally of councillor posts stood at 10, including the independents they co-opted. This year, the Parishad seems to have won just one councillor post – in the School of Computational and Integrated Sciences – of the 31 up for grabs. The Parishad has not taken the defeat well. While a sweep by the Left is not new in Jawaharlal Nehru University elections, this year’s acrimony and violence over counting was. Pandey alleged that the election committee was biased and was rigging the process in favour of the Left. This led to an extraordinary situation on Saturday which saw him and two others occupy the counting centre in the School of International Studies for over 14 hours compelling the election committee to suspend counting for those hours. The Parishad appealed to the Grievance Redressal Cell, which has university staff as members, and after hours of meetings with the election committee, counting resumed at about 6.30 pm on Saturday and on the election committee’s terms. 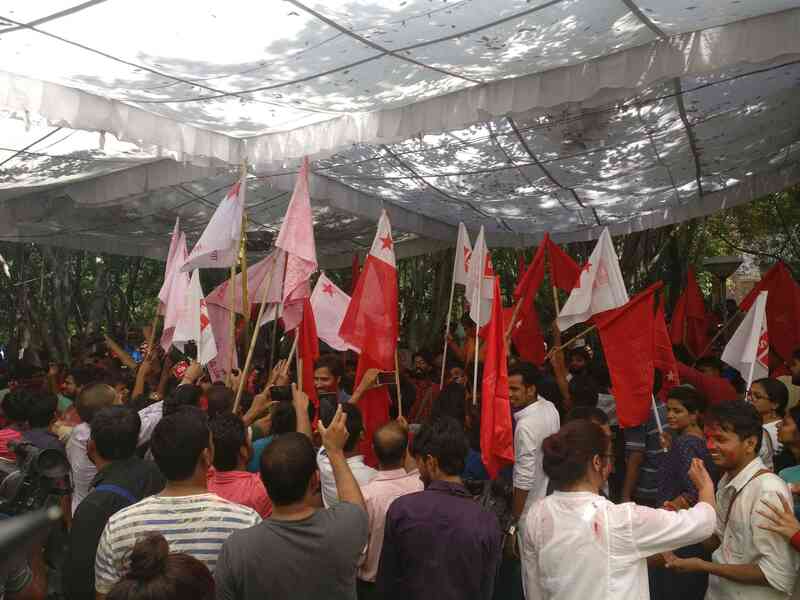 When the results were declared around 2 pm on Sunday and the committee’s members emerged, students who supported the Left Unity candidates gave them several laal salaams or red salutes – a raised fist. In 2018, the Jawaharlal Nehru Students’ Union elections saw the highest voter turnout since 2012 – about 68% – and an increase of nearly 10 percentage points over last year. The Akhil Bharatiya Vidyarthi Parishad is blaming the election committee and the banding together of the Left groups for its loss. 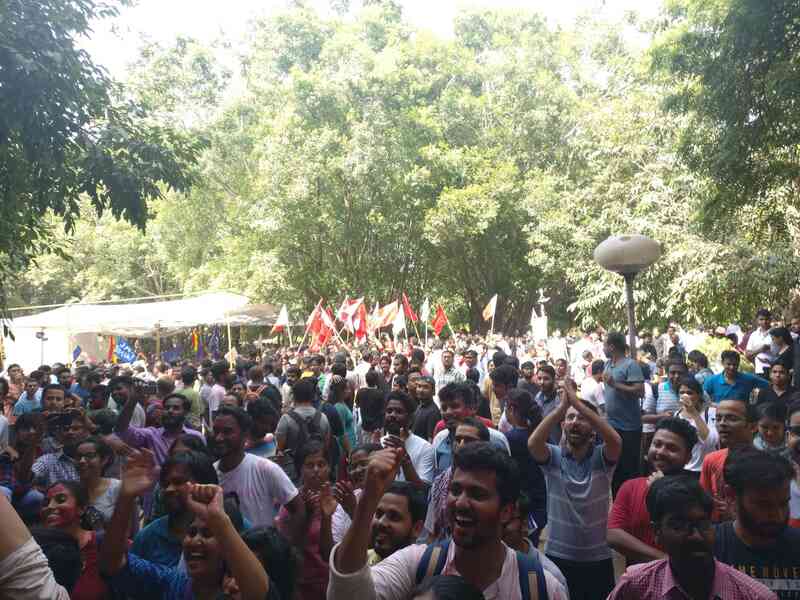 Evading questions on why the science students did not come through for them, Pandey said that his is actually the “largest organisation on campus” and have been defeated only because four organisations have contested together “in fear of the ABVP’s popularity”. He is right. Left Unity was formed in response to the tumult on campus in 2016 wrought in part by an ascendant Parishad and has inducted new partners every year. But the Left groups have a different explanation for science students abandoning the Parishad. They believe that the Parishad’s response to allegations of sexual harassment against a faculty member sympathetic to them had a role to play. These came to light in March. “It was like any other harassment case but the way the ABVP, the university administration and the BJP administration worked to protect the professor showed students that getting ABVP out was the only way to be rid of this professor,” said Dinesh, a research scholar in the Centre for Historical Studies. A member of the All India Students’ Association alleged that the Parishad complained against the election committee only after a loss in the science schools seemed imminent, although Pandey said that the Parishad had been unhappy for some time. “This election committee cancelled our Janmashtami programme even though the organisation’s name was nowhere on the posters,” he said. “Then they deliberately started the presidential debate at midnight so that the ordinary students left and did not hear our speeches at all.” The presidential debate, a longstanding JNU tradition, has always been a late-night affair but the Parishad’s main allegation is that the election committee did not count the science school votes for the central panel in the presence of the Parishad’s counting agents. Unlike Delhi University, Jawaharlal Nehru University’s election committee is composed entirely of students. Counting usually begins the same day as polling and continues – through days and nights – till the results are declared. Through that entire process, students belonging to different groups stay parked outside the counting centre – typically the building of the School of International Studies – and keep track of the trends. The election committee calls counting agents from each party for transparency but sometimes they fail to show up on time. Once the ballot box is opened, the agents for that round are not allowed inside. This, according to a former union-member who was on campus till the 2017 elections, is a common occurrence. “Last year BAPSA’s counting agents were not allowed to go in,” he said, referring to the Birsa Ambedkar Phule Students’ Association. This year, the Parishad’s counting agents were absent from the centre when ballots from the science and special centres were counted. This, Pandey contended, was in violation of the Jawaharlal Nehru University Students’ Union constitution and alleged that the election committee had become a “fifth partner” in Left Unity. At about 3 am on Saturday, he and a few others entered the counting centre in protest. The election committee is put together by the previous union but there are checks built into that system as well. Councillors of each school propose names for the election committee before the students – who can approve or object to the names – before the rest of the election process begins. Even a single student can raise an objection to a selection. The main union proposes only the name of the chairperson of the committee. Between the proposal of the names and polling, there are several all-organisation meetings during which objections can also be raised. Pandey did not say if the Parishad had made objections to the members of the committee in writing before the elections began. He received 43 more votes than Balaji in the science schools and special centres combined. This account alarmed the student community and by 11 pm, students and even alumni were sharing frantic messages about the Akhil Bharatiya Vidyarthi Parishad bringing in reinforcements from outside the university. Students claimed that security logs at the university gates showed that four Scorpios – sports utility vehicles that are an unusual sight in Jawaharlal Nehru University – were let into the campus against the name of Saurabh Sharma, who was joint secretary in 2016, and belongs to the Parishad. Gourab Ghosh from the Students’ Federation of India said that there were at least 60 people, all outsiders, sitting on the Parshad’s side of the lawn outside the counting centre. Fearing violence, student activists asked others to gather at the counting centre and this brought hundreds of “ordinary students” and even teachers to the venue in the middle of the night. Policemen in plain clothes lurked on campus and Central Reserved Police Force were posted outside even past midnight. But the appeal for support set off wild rumour-mongering – some heard gunshots, a security guard apparently reported a kidnapping. The police dismissed both as rumours. Well after midnight, Saurabh Sharma issued a statement denying letting anyone in but also alleged that the Left had called 25 sword-bearing supporters “from Jamia [Millia Islamia University]” to the campus. Celebrations had begun over an hour before the final results were declared. The Left Unity candidates were so far ahead that no upset was expected. (Photo credit: Shreya Roy Chowdhury). Despite Saturday’s tensions and delay, once counting resumed, it progressed and concluded peacefully. The throng of Left supporters at the counting centre let out sarcastic “awws” every time a Parishad candidate’s tally of votes was announced. Students cheering for the election committee after the declaration of results. (Photo credit: Shreya Roy Chowdhury).